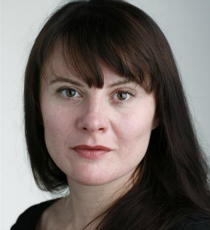 Monica Dolan an is actor whose film credits include playing Marion in Pride and Janice in Sightseers. She has featured in television programmes such as The Casual Vacancy, Occupation and Appropriate Adult, for which she won a Bafta Award for Best Supporting Actress. Monica’s theatre appearances include The Twits (Royal Court Theatre) and King Lear (RSC). She can be seen most recent in TV series Vanity Far.